Oh, my goodness I do love a 1-pot meal. What’s not to love? Less dishes, less fuss, less stress…did I mention less dishes? 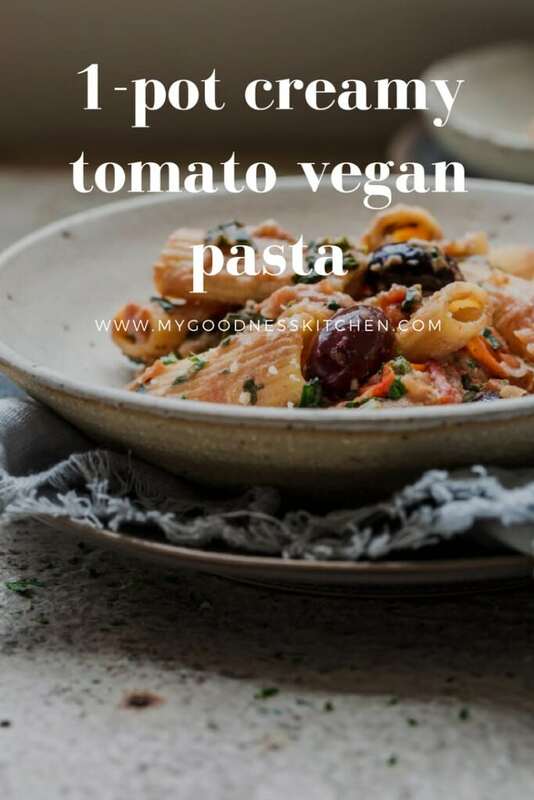 This 1-Pot Creamy Tomato Vegan Pasta is a wonderfully simple and delicious addition to the weekday meals rotation. I think I could live quite comfortably in a world where all meals were cooked in a single pot. I am not a fancy gal and we are not a fancy family. Hell, I fed my child chips for dinner…just chips. While it wasn’t a shining culinary moment, I am OK with it because weekdays are busy and coming up with weekday meals can be tricky. I could meal plan, I should meal plan but I do not meal plan. I will meal plan. Soon. In lieu of strategy, I have a cupboard full of ingredients and a 1-pot mind. 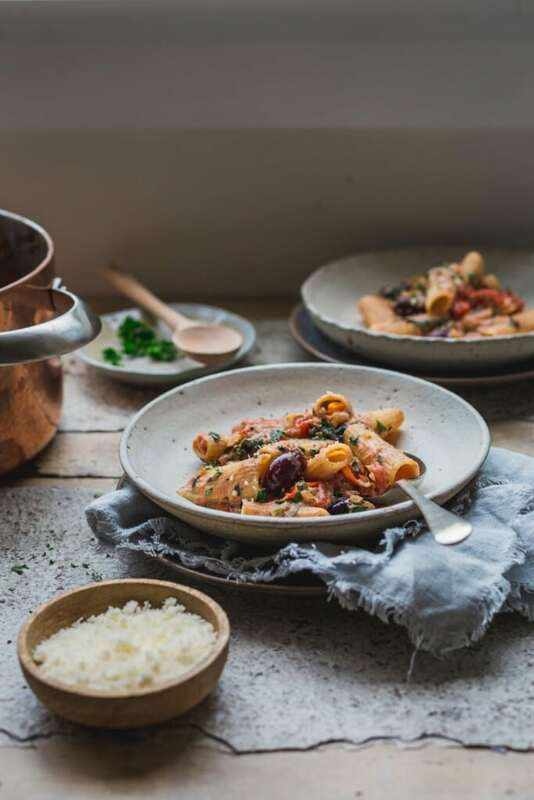 Pasta is probably the quickest and simplest 1-pot adventure you can try although buckwheat risottos and bowls deserve an honourable mention. Also, pasta is a pretty safe bet with the kids. 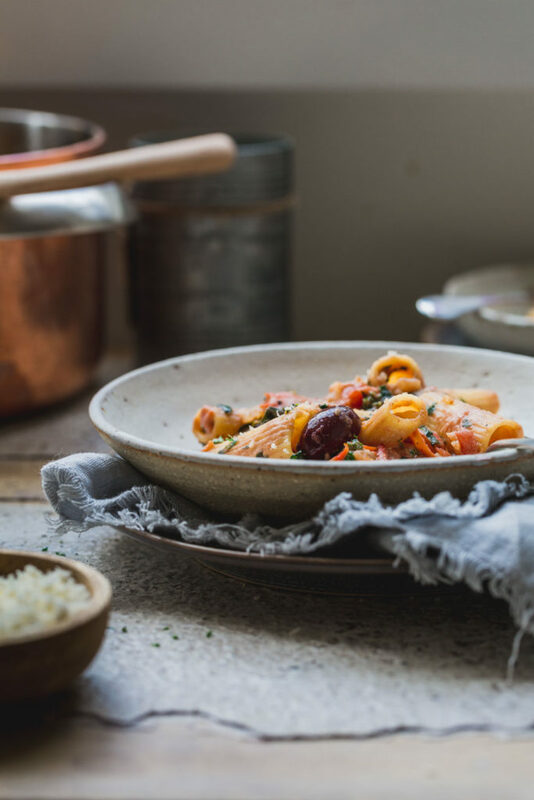 This 1-pot creamy tomato vegan pasta is a pretty safe bet. I’ve done tests. My 4 year-old daughter and I have a long-running tabletop cold war thing going on and have had for a few years now. I know I am not alone in the trenches and I know that some nights the battle to try new things is just…too hard. Add kindergarten/school, work, sports, social crap (hers not mine) and the days can get tricky and a might overwhelming. So, in light of all this, I hereby give myself permission to draw on my arsenal of quick weekday meals and instead of slaving in the kitchen, spend time with my kid. Instead of nagging her to eat her vegetables I’m going to play on the floor with her while we eat bowls of my 1-pot creamy tomato vegan pasta. My rug might not thank me but my daughter will. 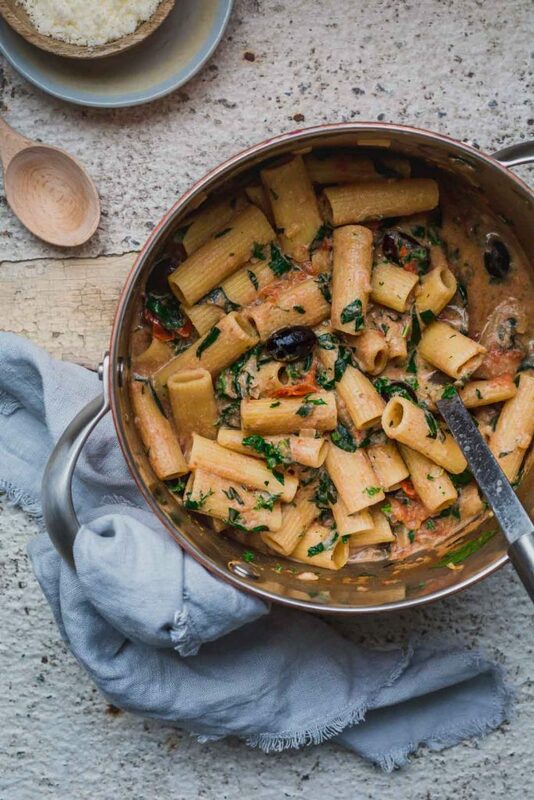 Why is this 1-pot creamy tomato vegan pasta so good? One pot = less dishes. Enjoy. Heat the olive oil over medium heat in a mid to large pot and add the chopped onion. Cook until soft, around 3 minutes. Add the minced garlic, cherry tomatoes, tomato paste and diced canned tomatoes with the dried oregano and cook for another minute. Add a pinch of sea salt and then stir in the stock and dairy-free milk. Add the dried pasta and pop a lid on the pot. Increase the heat and cook with the lid on until the mixture comes up to a boil. 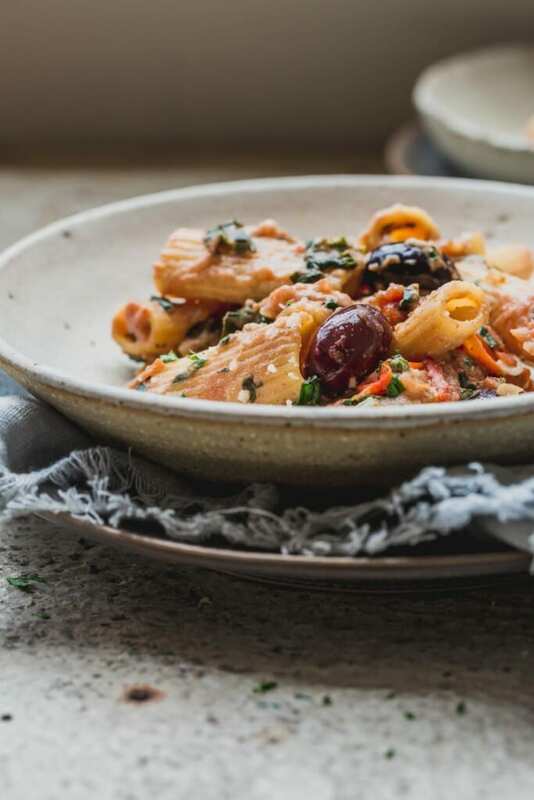 Remove the lid, reduce the heat back to medium and cook for 5 minutes, stirring regularly to prevent sticking, before adding the olives, nutritional yeast and chopped spinach. Cook, stirring regularly, until the pasta is just al dente, around 5 minutes, stir in the parsley and remove the pot from the heat. Allow the pasta to sit for a a few minutes with the lid on so the sauce continues to thicken. Serve with vegan parmesan. You'll need a medium pot with a lid for this recipe. I’ve made this recipe over and over and over. It’s sooo marvelous, luscious, and cozy! Thank you for sharing! Hi. Sunday slump and smashed avo on toast was looking like a serious option for supper. The Leprechaun was unimpressed & reminded me I had mentioned a new recipe…. so I grabbed my pot & in no time at all, an absolutely delicious, easy meal. Thank you!! Will be added to the regular menu. Thanks lady. I hope the family loves it. 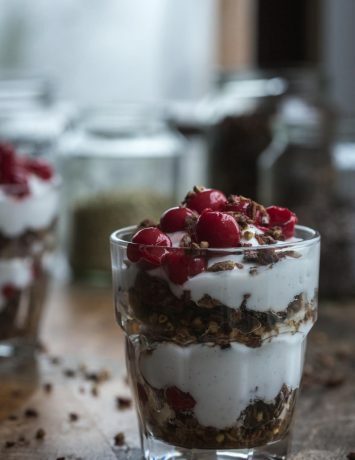 Now let’s talk about the phenomenal coffee granola slice on your blog right now. Your desserts kill me.